EA: Cancelled NBA Elite "Was Going to Be a Bad Game"
It's never a good idea to completely shelve a game, but EA Sports might have made the tough call cancelling NBA Elite for the right reason. NBA Elite was supposed to be a rebirth. EA Sports renamed the NBA Live franchise and wanted to completely change the way that players went about controlling a basketball game. Unfortunately, the game sucked, and EA decided to pull the plug on a 2010 release, leaving NBA 2K11 as the sole basketball sim on the market this year. (I don't count NBA Jam as a sim, even though it is awesome.) The cancellation caused a shakeup in how sports games are managed at EA Sports to prevent this kind of thing from happening again. Development of future NBA games have also been shifted from EA Canada to EA Tiburon, makers of the Madden franchise. EA Sports exec Andrew Wilson said that it was hard to make the choice to cancel the game, but that it had to be done in order to release a strong product. "We're proud that we made the choice to not just put something out there that wasn't good," Wilson said. "Ultimately, it was just going to be a bad game." 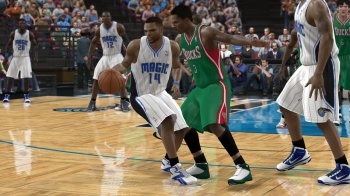 The goals for releasing a rebooted NBA Live 2011 might just have been a little too ambitious. "I think that the goal of reinventing how people play basketball games and giving the gamer infinitely more control over the outcomes that appear on the screen in front of them, was something that just needed to take longer than we had," Wilson said. "We knew the goal was aggressive. But at the same time, we believed it was an important enough goal for the gamer, who'd been playing basketball games in a very similar way for a very long time." Wilson also wanted to make clear that the development shifting to Tiburon was not in any way an indictment of the work that EA Canada had already accomplished. "This is not about the current Elite team failing," Wilson said. "In fact, I think they did a tremendous job to get to where they did. I'm very proud of their willingness to jump in and take a risk and try and reinvent the business." Still, with over a year of development already underway, it's possible that the next as-yet-unannounced NBA Elite game will be something special. I respect that EA didn't feel obligated to release a game that might not have been able to compete with 2K Sports' excellent NBA 2K11, but I look forward to the renewed series rivalry next year.